Lamonte Turner hit the biggest shot of his career to bury No. 24 Kentucky on Tuesday night and sweep the Wildcats for the first time since 1998-99. 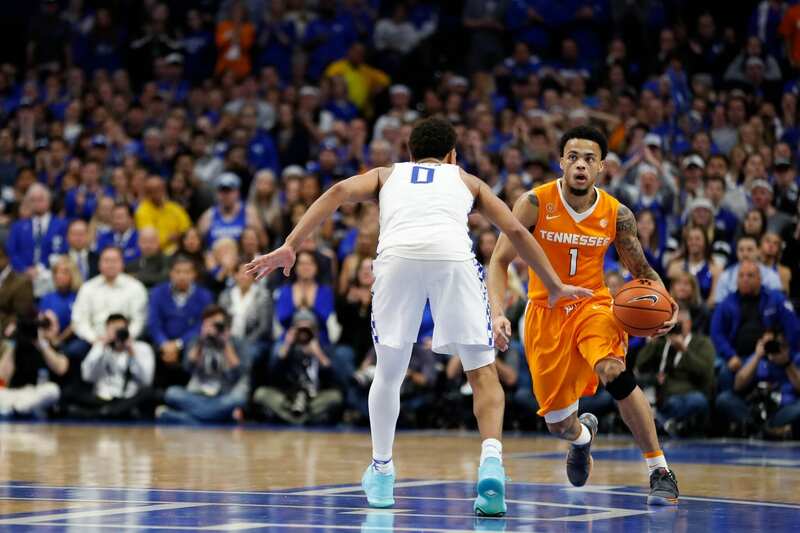 Lamonte Turner etched his name in Tennessee basketball history books Tuesday night. Trailing 58-56 with 28 seconds remaining and 10 seconds left on the shot clock, Turner drilled a deep three to give Tennessee a 59-58 lead. Following Turner’s clutch three, Jordan Bowden forced a turnover and threw it ahead to Admiral Schofield who threw down a vicious dunk. The dunk gave Tennessee a 61-58 lead with four seconds remaining and put the dagger in Kentucky. As a result, No. 15 Tennessee (18-5, 8-3 SEC) picked up its first win in Rupp Arena since 2006 and sweeps the season-series with No. 24 Kentucky (17-7, 6-5 SEC) for the first time since 1998-99. The matchup wasn’t all sunshine and roses for the Vols on Tuesday night. For the first time in quite some time, the Vols offense didn’t show up ready to play. The one person who did come ready to play though was Turner. The redshirt-sophomore out of Huntsville, Alabama carried Tennessee through an ugly first half. Turner led Tennessee with 16 points on the night, 11 of which came in the first half. In the opening frame, Turner’s teammates were just 6-of-20 from the field and 0-of-7 from the three-point line while Turner was 4-of-6 from the floor and 3-of-4 from beyond-the-arc. Despite the offensive struggles in the first half, Tennessee built a 27-26 halftime lead thanks to its play on the defensive end. In the first ten minutes of the half, Kentucky shot just 1-of-9 from the field and turned it over five times. The Cats didn’t score their first field goal until 14 and a half minutes into the game. The loss of Kyle Alexander played a big role in the Vols’ first half struggles. With 12:25 remaining in the half, Alexander picked up his second foul and was forced to sit on the bench for the remainder of the half. In just six minutes, the junior had scored four points, hauled in two rebounds, blocked two shots and picked up a steal. Bowden stepped up in the second half while his teammates struggled, scoring 11 of his 13 points in the final 20 minutes. The affair flipped back-and-forth in the second half, as neither team led by more than three points until Grant Williams knocked down a pair of free throws to take a 50-46 lead. The Cats would then go on a 7-0 run capped by a Kevin Knox and-one to take a 53-50 lead. Following a pair of Bowden free throws, Tennessee cut the lead to one. After Kentucky took a 58-56 lead, Alexander forced a game-changing Kentucky turnover. Barnes then called a timeout that set up the Turner three to take the lead–a lead that the Vols wouldn’t give up on their way to just their fifth all-time win in Rupp Arena. Bowden would go on to finish with 13 points and eight rebounds on 4-of-8 shooting. Schofield finished with 12 points and six rebounds, while Grant Williams scored 10 points on 8-of-10 shooting from the free throw line. Tennessee has little time to soak in the victory. The Vols will head to Tuscaloosa Saturday to take on a talented but young Alabama team at 6 p.m. ET. “It’s all Alabama now,” Turner said.